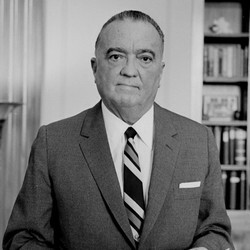 J. Edgar Hoover, the first director of the Federal Bureau of Investigation, served his country for more than 40 years. However, J. Edgar Hoover and controversy will forever be linked. Although he made great strides in improving the investigative and training techniques of his beloved FBI, swirling rumors surrounding his personal life and covert, illegal surveillance operations in his professional life combined to make a perfect storm of controversy. In fact, J. Edgar Hoover has been – and always will be – one of the most controversial historical figures in U.S. history. Continually plagued by accusations of rampant abuse of power, personal vendettas, and obsessive surveillance of co-workers, friends, powerful politicians, and those he designated 'enemies' for sometimes no apparent reason, he will probably be discussed for the remainder of recorded time. Born in Washington, D. C. on New Year's Day, 1895, Hoover's parents were both descended from foreign-born ancestors. He spent his early years attending night classes at George Washington University, earning a degree in law. In 1917, he was accepted in the bar, and became Special Assistant to Attorney General A. Mitchell Palmer. In 1924, he was named as director of the Bureau of Investigations, where he remained as director of the Federal Bureau of Investigation (established as such in 1935) until his death in 1972. His career as director encompassed the tenure of eight presidents, from Coolidge to Nixon. Despite reputed discussions about removing him as the FBI's director, he remained in the coveted position until his death, due to a huge collection of surveillance and intelligence amassed in an attempt to secure his place as one of the highest-powered government employees. Throughout his infamous career, he focused his personal vendettas on the likes of Marcus Garvey, a Jamaican leader who was a proponent of the Pan-African cause for black Americans. Hoover also conducted a personal war of hatred against civil rights leader and activist Martin Luther King, Jr. for no reason other than an attempt to discredit him in the eyes of his followers (the entire black American community in the U.S.) When his efforts to get the media to report King's alleged infidelity failed, Hoover committed a now-infamous error: he sent a recording of alleged philandering directly to King's office, suggesting the leader end his life. This ploy failed, but Hoover did not give up until King's tragic assassination in 1968. Was J. Edgar Hoover a transformative historical figure in American society? The answer is an emphatic: yes. He made the FBI one of the most proficient crime investigation units on Earth, completely overhauling their training system, and updating their crime unit techniques, including an expansion of fingerprinting and indexing. However, he was (and still is) an extremely controversial government leader, with those on both sides of the argument expressing their opinions quite vehemently. In fact, controversy was J. Edgar Hoover's most notable contribution to American history, even when he didn't intend to be. Was J Edgar Hoover President?